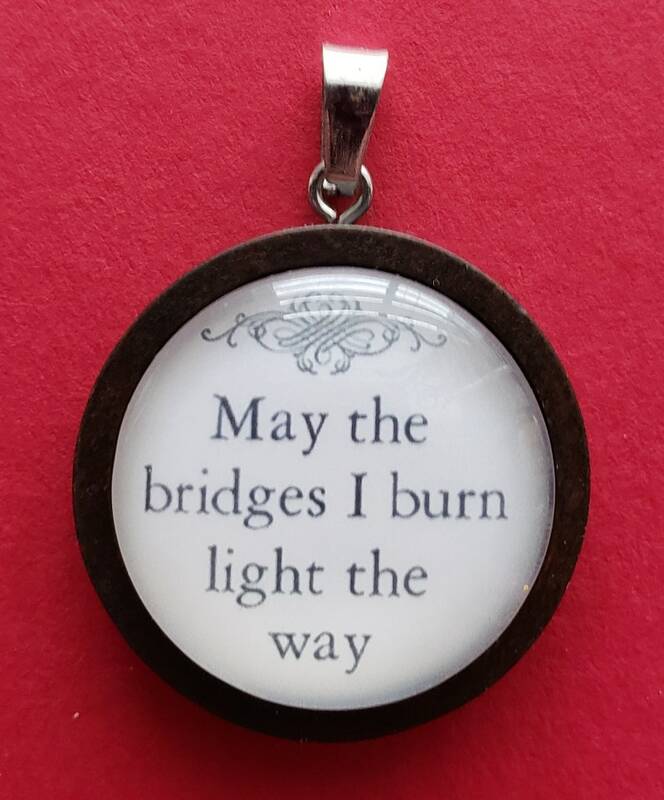 "May the Bridges I Burn Light the Way" offers a light-hearted and sassy look at your past, as well as your future! This handmade pendant features a glass dome inside a rich brown wood bezel, complete with stainless steel hardware. Order it as shown by itself, or if you prefer a necklace or key chain, we offer those options. The necklace option will include an 18" delicate stainless steel chain (if you need a longer or shorter chain, we can arrange that for an additional cost). The key chain option will include a stainless steel split ring that is durable and easy to use. See photographs for the available options. YES, these are available in bulk for a discount! Please send us a message to discuss. Also, please see our listings for other styles. Pendant is about 1.25" / 30mm at its widest point, not including the bail. The glass piece is 1" /25mm in diameter.